NOTE: The JB650 A3 and A1 model specifics are only lightly covered. For normal, non-specific JB 650 A3 / A1 repairs the book should really help you. Support the Jet Ski on a stand or on wooden boxes so that it is secure. Remove the battery as described in Chapter Nine. Remove the carburetor and exhaust pipe-expansion chamber assembly as descreibed in Chapter Eight. Disconnect the spark plug wire at the plug. Then loosen but do not remove the spark plug. If necessary, the engine piston and cylinder can be removed before removing the engine from the hull. Refer to Cylinder in this chapter. Remove the bolts holding the coupling guard (Figure 5) to the mounting lugs in the bottom of the hull. Remove the guard. Remove the bolts securing the electric case cap (Figure 6) to the case. Pull the cap away from the case. Disconnect the 4-pin connector and the bullet connectors inside the case. Unscrew the grommet cap and take out the wires. See Figure 7. Disconnect the oil inlet line at the oil pump. Plug the line to prevent oil from running out into the hull. Loosen the engine mounting bolts. Then remove any shims located under the engine bed. Label the shims for location and position so that they can be installed in the same position during engine installation. Remove the bolts and washers. Slide the engine forward to disconnect the coupler halves. Then lift the engine up and remove it from the hull. 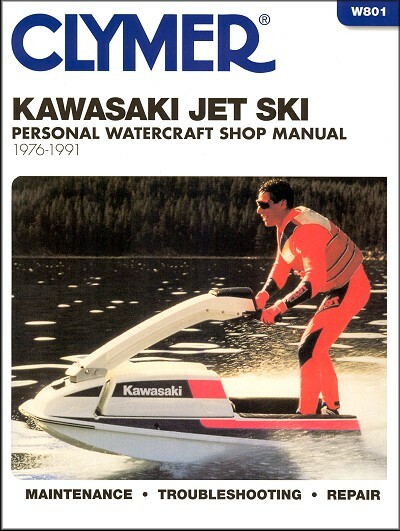 Ask a question about Kawasaki Jet Ski 300-650 Repair Manual 1976-1991. Very little info. on JB650A1 Merchant's comment: We offer a 30 day guarantee if you are unhappy with this book. Thanks for your business. The order page said this book covered the Kawasaki Jet Mate KAW 650 JB A3. The book does not. Merchant's comment: We offer a 30 day money back guarantee. Please call our customer service to return. Thank you for your business! This manual has everything I need to maintain and troubleshoot my jetski.